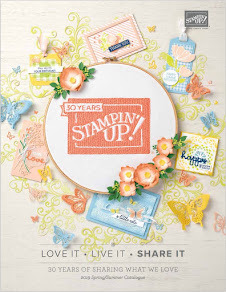 SAB Preview - Mini Blog Hop! If you place an order or host a party that makes sales of £300 or more, then you can choose an additional one of the FREE gifts. My project consists of a little Treat Holder and a matching card. The colour combination used is Poppy Parade, Lucky Limeade, Blushing Bride and Whisper White. I have used 2 Sale-a-Bration products on this project. A little of the Everyday Enchantment Paper Pack and the Fresh Vintage Stamp set. Remember you can earn these products FREE during Sale-a-Bration! The sentiment is from the Clearly For You stamp set which I have punched out using the small Oval Punch. The ribbon is the Poppy Parade Stitched Poly. The beautiful floral image has been inked up using the Stampin' Write Marker pens. The previous stop in this Blog Hop was the wonderful Jo. The next stop on this Blog Hop is the lovely Gen.
Gorgeous! How can anyone not love those papers and co-ordinating stamp!!! beautiful card & treat holder! 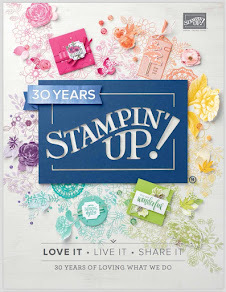 I haven't used this stamp set yet but know it's on my must do list for this week. The dsp pack in the SAB catalog has made those colors my favorite ones now. Thanks for sharing! This stamp is even more stunning when you cut around outline and the colour combination is fab - love it!